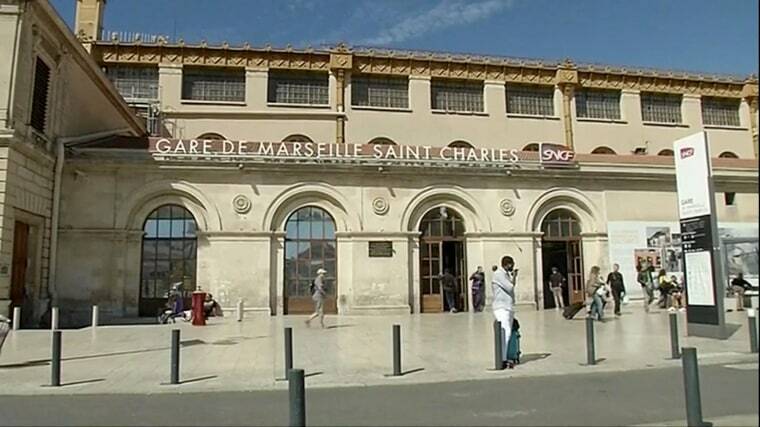 Gare de Marseille Saint Charles, where U.S. tourists were targeted in an acid attack on Sunday. PARIS — Four young U.S. women were attacked with acid Sunday in the French city of Marseille by a woman who has been arrested, the Marseille prosecutor's office said. Two of the tourists were injured in the face in the attack in the city's main Saint Charles train station, and one of them has a possible eye injury, a spokeswoman for the prosecutor's office told The Associated Press. The young women are all juniors at Boston College, the university said in a statement Sunday afternoon. They were treated at a hospital but have since been released, it said. "It appears that the students are fine, considering the circumstances, though they may require additional treatment for burns," said Nick Gozik, director of the college's Office of International Programs. "We have been in contact with the students and their parents and remain in touch with French officials and the U.S. Embassy regarding the incident." Boston College identified the students as Courtney Siverling, Charlotte Kaufman and Michelle Krug, who are enrolled in the school's Paris program, and Kesley Korsten, who was studying at Copenhagen Business School in Denmark. Authorities had so far offered no motive, Dunn said, adding that the students would probably remain in Europe for the rest of the semester. The Paris prosecutor's office said its counterterrorism division has decided for the time being not to assume jurisdiction for investigating the attack. The prosecutor's office in the capital, which has responsibility for all terrorism-related cases in France, did not explain its reasoning. The spokeswoman for the Marseille prosecutor's office said the 41-year-old female suspect did not make any extremist threats or declarations during the attack. She said there were no obvious indications that the woman's actions were terrorism-related but added that officials could not be 100 percent sure about ruling out terrorist links so early stage in the investigation. The spokeswoman spoke on condition of anonymity, per the custom of the French judicial system. She released no further details. A spokesman for the U.S. Embassy in Paris said the U.S. consulate in Marseille was in contact with French authorities about the investigation and the women's conditions. U.S. authorities in France were not immediately commenting to protect the tourists' privacy, embassy spokesman Alex Daniels said. In previous incidents in Marseille, a port city in southern France closer to Barcelona in Spain than to Paris, a driver deliberately rammed into two bus stops last month, killing a woman. Officials said the attack wasn't terrorism-related. French police say that in April they thwarted an imminent "terror attack" and arrested two suspected radicals in Marseille just days before the first round of presidential election. Paris prosecutor Francois Molins told reporters that the two suspects "were getting ready to carry out an imminent, violent action" on French territory. Daniella Silva and Tim Stelloh contributed.